Uganda’s representatives continue to register poor results at the ongoing Rio games in Brazil. In action today were three Ugandans in the men Olympic 10,000 metres. 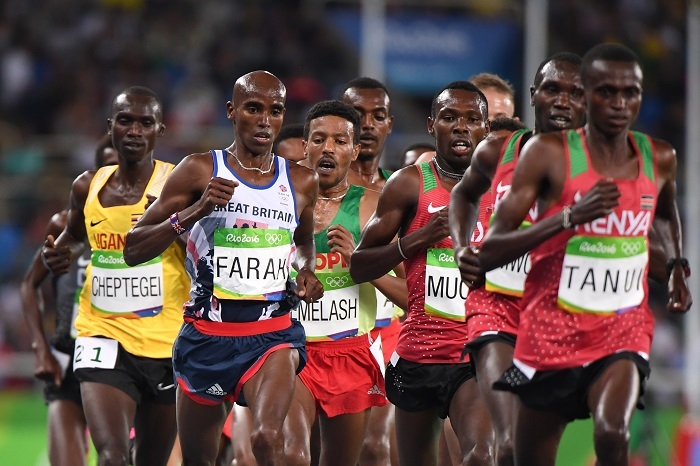 The race was won by Britain’s Mo Farah . The 33-year-old produced a trademark surge over the last 100 metres to time 27min 05.17sec in the 25-lap race. According to AFP, Uganda’s Joshua Cheptegei kept pace with the leaders all through. However he lacked what it required in the last two laps to be denied glory. He finished 6th with a personal best of 27:10.06 and in 6th place. He returns next week for the 5,000m. Kenya’s Paul Tanui took silver, with Ethiopia’s Tamirat Tola was third. The USA leads with 60 medals, followed by China with 41 medals, Great Britain with 30 medals. While Japan has 24 medals. Germany has 16 medals. on the African continent, South Africa has 06 medals, Ethiopia 03 medals. Kenya 2, Egypt 2 and Tunisia 1. the rest of African countries are yet to secure a medal.